He attended Tehran University in 1966 to study fine art and traditional calligraphy, before going on the attain a teaching position there in 1971. Mohammad Ehsai is a master calligrapher turned artist who uses dense, interlaced texts to provide a contemplative space for language that does not rely on direct translation. His works are inspired by Western abstraction and Chinese brush painting. Large in scale and often brightly colored upon black backgrounds, his compositions require perceptive silence rather than reading skills, and seek to convey the heavenly power that calligraphy has traditionally possessed. By toying with proportion, ratio, and scale, these works visualize a distinct mysticism in their interpretation and take on the utopian ideals of Modernism. The artist has created illustrious murals and private commissions, using his own unique style to transform the ways in which this seemingly rigid text might be distilled. Ehsai’s murals can be found on the Iranian Embassy in Abu Dhabi and the Natural Museum of Iran. He has exhibited extensively in Tehran and has had work in institutions such as the British Museum, London, The State Hermitage Museum, St. Petersburg, Leighton House Museum, London, and Beirut Exhibition Center, among others. 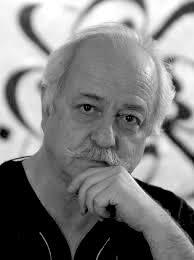 He received the National Award or Art and Culture in Iran in 2005. Art consultant to the Tehran Contemporary Art Museum.